This very rare photograph shows actors performing on stage in a theater filled with children and lighted by electric lamps. Two musicians can be seen at the far right. 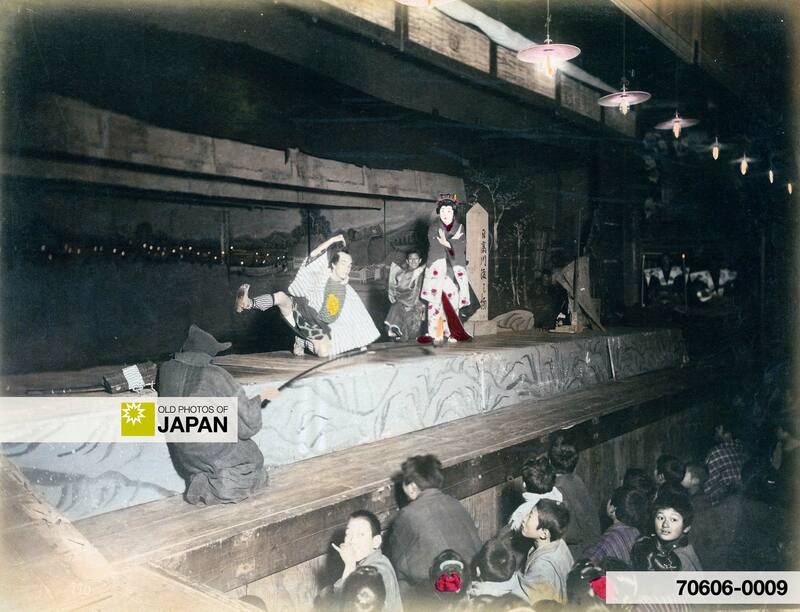 A stage assistant (後見, Koken) in black sits in the front holding a pole. Another assistant sits behind the actor playing the woman. Although clearly in plain sight, Japanese audiences had grown used to the idea that Koken were “invisible”. The black clothing reinforced this concept. The sign next to the actor who plays the woman says “Hidakagawa Ferry Landing” (日高川渡し場, Hidakagawa Watashiba). 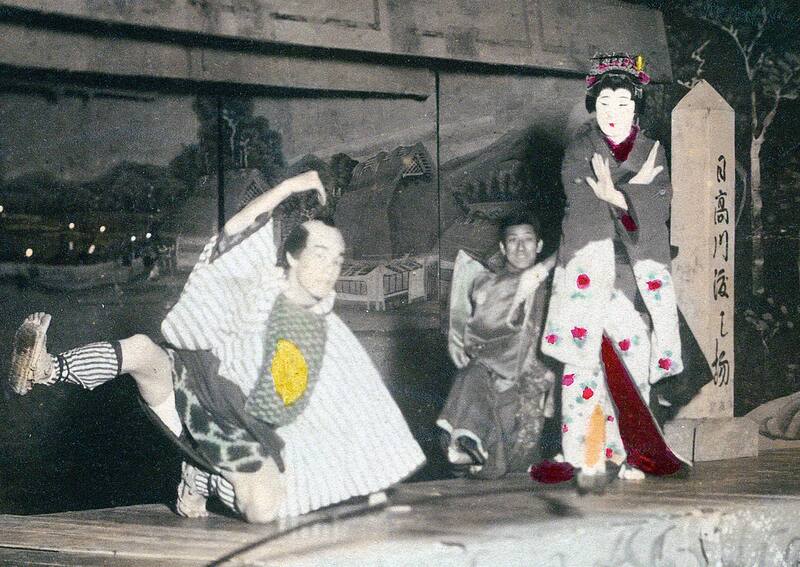 This identifies the play as Hidakagawa Iriaizakura (日高川入相花王, The Cherry Trees Along the Hidaka River), originally a Bunraku (puppet theater) play. This detail clearly shows the sign, the actors and the painted backdrop. Hidakagawa Iriaizakura tells the story of a woman called Kiyohime who falls in love with the priest Anchin. He rejects her love and instructs a ferryman to not let her cross the Hidaka River. Enraged, Kiyohime jumps into the river where she is transformed into a violent serpent. She crosses the river and finds Anchin hiding in the bell of Dojoji temple. She wraps herself around the giant bell and burns both the bell and Anchin in a sea of fire. Dojoji temple actually exists and is located in Hidakagawa-cho, Hidaka-gun, Wakayama Prefecture. Hidakagawa Iriaizakura was a popular story and the scene of Kiyohime and the ferryman can be seen on a number of Ukiyoe prints. The video clip below shows a scene from the original Bunraku version. In this particular scene Kiyohime dramatically transforms into a serpent. 1 I have as yet been unable to attribute this image, but it features the number 770 in the negative. 2 For more information about Japanese theater, visit the site of the National Theater of Japan (Japanese and English). 3 The Tonda Traditional Bunraku Puppet Troupe is one of several Bunraku Troupes that perform Hidakagawa Iriaizakura. They have been designated an Intangible Cultural Treasure. You can also licence this image online: 70606-0009 @ MeijiShowa.com.